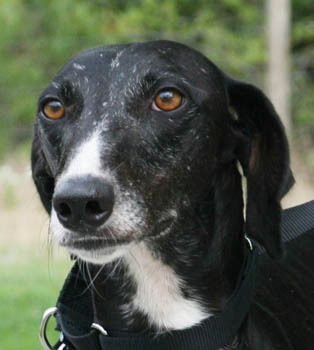 Arthur is a small, untattooed, black male with white feet, and a splash of white on his nose, tail and chest. He is estimated to be about 2 years old. He was found as a stray on a ranch outside of Crosbyton, TX near Lubbock along with Penelope and Timothy. All three are thin and were extremely happy to find someone willing to shelter, water, and feed them! 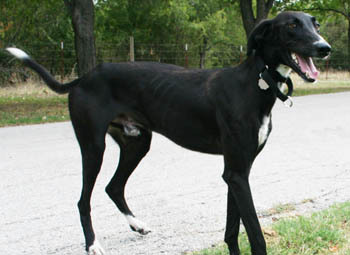 Thankfully, Arthur is heartworm negative, and GALT's West Texas representatives took good care of him. Since these pictures, Arthur has had his tail docked due to an injury. Arthur was in a home for a couple of months, but has since returned to GALT through no fault of his own. 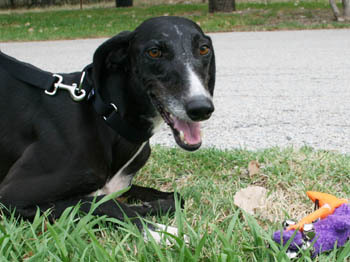 Arthur is a sweet, handsome boy who loves playing with stuffed animals, wrestling and running. He is very attentive and extremely obedient. He is smaller than most male greyhounds. Arthur's tail was bobbed but his ears are floppy so he looks a little like Goofy and has the personality to match. Arthur is housetrained, great with people, children, other dogs, and cats. Arthur is working on his obedience training and already knows sit, shake, down, and leave it. He loves his toys and chewing on his rawhides. He is a COOKIE MONSTER and goes bonkers for his treats. Arthur would do great in an active home with kids and other pets because he really loves to run and play with people and other dogs.